The list of powerful men accused of sexually assaulting women is growing day by day. How are men reacting to this moment of cultural reckoning? Guest-host Gillian Findlay talks to La Presse columnist Patrick Lagacé, Jeff Perera, the founder of Higher Unlearning, and BuzzFeed Canada writer Ishmael Daro. Harvey Weinstein is far from the first man to be accused of sexually harassing or assaulting women. But the allegations against him, seem to have changed something fundamental in our culture. Assaults and indignities that were once tolerated, silently, are now being openly denounced. Names are being named like never before. Film director James Toback. Actor Jeffrey Tambor. Journalist Mark Halperin. TV host Charlie Rose. Comedian Louis C.K. Politicians Al Franken and Roy Moore. Here in Canada, the founder of the "Just for Laughs" comedy festival, Gilbert Rozon. Powerful men accused of sexually assaulting women are, perhaps the first time, facing serious consequences. Reputations, not to mention, careers, lie in tatters. Of course there are notable exceptions. US.. presidents, past and present, have so far escaped repercussions for their alleged misdeeds. 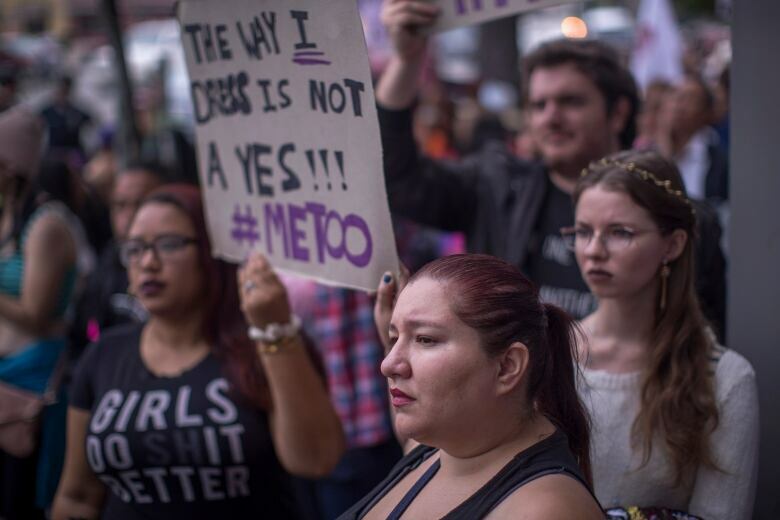 #MeToo Survivors' March on November 12, 2017 in Los Angeles, California. 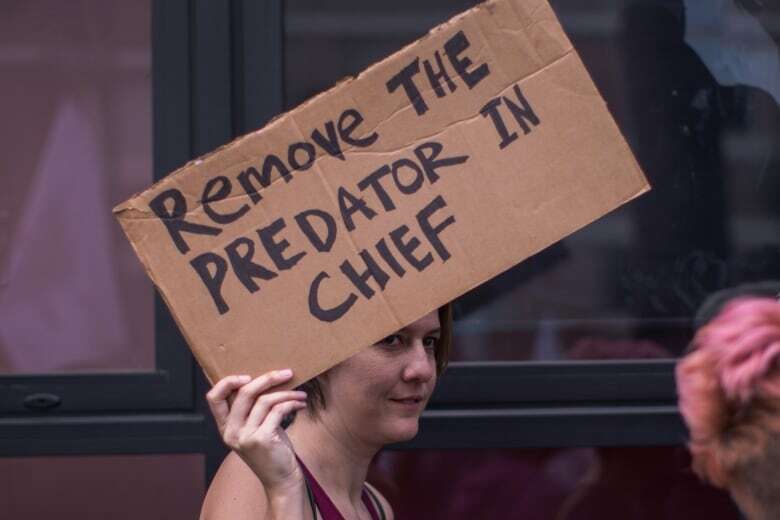 The protest was organized by Tarana Burke, who created the viral hashtag #MeToo after reports of alleged sexual abuse and sexual harassment by the now disgraced former movie mogul, Harvey Weinstein. 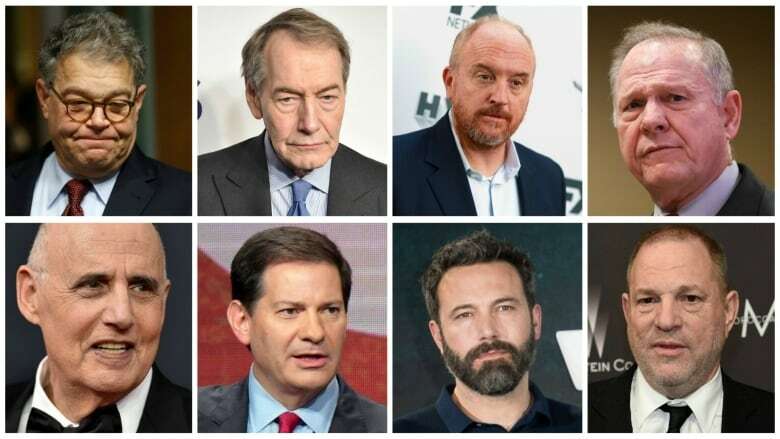 (David McNew/Getty Images)But as the list of recognizable names grows, men everywhere are starting to examine their own lives, to question their own behaviour, and — along with women — to wonder what it will take to change a culture of male aggression and entitlement. 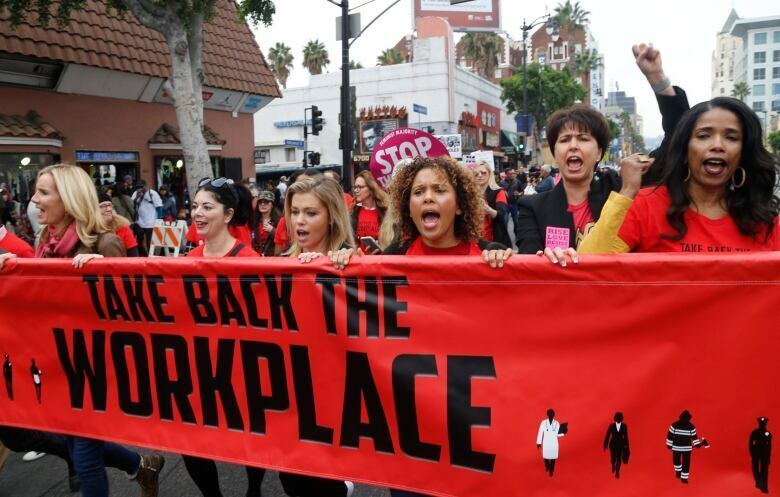 The subject of sexual harassment has crossed the gender divide. We invited three men to share their views with guest host Gillian Findlay. They are Patrick Lagacé, columnist for La Presse; Jeff Perera, the founder of Higher Unlearning, who is hired by schools and other organizations to talk about masculinity and male-female relations; and Ishmael Daro, a writer for BuzzFeed Canada, who also co-hosts the podcast Safe Space. For Jeff Perera, the current moment is more than just a day of reckoning for men; it's "a day of awakening." "It's more of an opportunity," he told Gillian Findlay, "to have some real honest conversations with each other about shame. There's a lot of shame about the mistakes that we've made that leads a lot of us to hiding it or avoiding these conversations." It's a chance, he says, for men to "lean into that discomfort" without getting defensive. 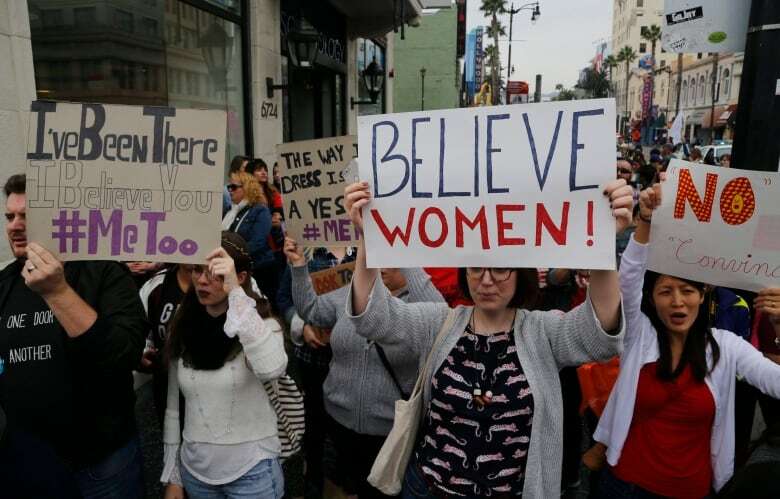 #MeToo Survivors' March on November 12, 2017 in Los Angeles, California. (David McNew/Getty Images)Ishmael Daro believes what sets the current moment apart is that we're no longer pointing the finger at just a few outliers. "We're getting stories on a spectrum that goes from really violent horrific stuff to power dynamics in the workplace," he says. "[It] is forcing men to acknowledge that it's a much wider spectrum and we are probably implicated ourselves." "That really makes you reevaluate and look back at your own experiences without blinders on," Daro adds. Patrick Lagacé says he's been having similar conversations with male peers. "We look in the rearview mirror," he says, "and say 'did I ever do or say something that could have been misinterpreted?" A lot of male behaviour is absorbed over time, rather than explicitly learned, Daro says. "It's the concept of toxic masculinity: that you absorb these ideas about what it means to be a man, what it means to be masculine. And you don't really question them." "Everything tells [men] that life is about asserting yourself," Perera adds. "The message for men is that the world is yours and you have to grab it and take it." That, he says, can often mean that men miss the signals women send in everyday interactions. Perera suggests that men need to practice more "mindful manhood," which he says comes down to being present in the moment and more mindful of other people's energy. For Lagacé, that also means knowing when to stop a pursuit. "A lot of men seem to think that it's a sale pitch: if they insist, just like a shoe seller, they might close the deal," he says. "And this is where I think … consent is trampled." Daro says the best way to ensure the current moment doesn't escape us — or, worse, turn into a backlash — is simply to believe the women coming forward. "It makes sense to start from a default position of trust and belief," he says. "We're allowed to re-evaluate down the road, but certainly when somebody has the courage to come forward, it's incumbent on men to applaud that and say we believe you." Participants march against sexual assault and harassment at the #MeToo March in the Hollywood section of Los Angeles on Sunday, Nov. 12, 2017. (Damian Dovarganes/Associated Press)But Lagacé argues that some degree of skepticism is necessary. He says false accusations are indeed rare and the police do hold a systemic bias towards victims. Yet, Lagacé adds, "I have difficulty saying I will believe anyone who comes out publicly and says I've been harassed or I've been groped or have been assaulted. That's a pretty steep step." "Nowadays saying so-and-so raped me … for a minority of people, men and women, can be a very powerful tool to settle scores," Lagacé adds. Perera says the small percentage of false claims should not get in the way of believing women. "There are going to be situations of false accusations, but to concede that truth ... doesn't undermine the overwhelming majority of folks who come forward and it's true." Many of the men facing allegations have seen their careers toppled. For Daro, this punishment fits the crime, as many of these men abused their jobs or public standing. But it's also important, he says, to talk about all the women who've been pushed out of the workplace by men. Participants march against sexual assault and harassment at the #MeToo March in the Hollywood section of Los Angeles on Sunday, Nov. 12, 2017. (Damian Dovarganes/Associated Press)"For every man who loses his career or his position ... there are so many women who were probably drummed out of their own industry because of harassment, because of being held back by a spiteful male co-worker," Daro says. "We can't really count those numbers, but we know it's quite steep." Lagacé says we need better mechanisms to protect women in the workplace. "When a famous producer is the head of his own production company, where do you complain?" "There needs to be some independent entity where people can take their grievances," he adds. Lagacé suggests we need policy changes like an external task force for reporting workplace harassment, so that "there can be an outside investigation that can do away with the internal politics," he says. For Perera, the changes that need to come are even broader. "There's that conversation as far as policy and procedure and workplace scenarios. There's also the larger societal conversation that we need to have, which is getting to have an honest conversation about our attitudes towards women and our ideas of what it is to be a man," he says. A lot of men, Perera says, "treat the women in our lives as instruments or obstacles." Women, he adds, then become reduced to rungs on a ladder towards obtaining power. Perera believes that doing away with these toxic notions of manhood requires more than just feel-good statements about the need for men to do better. It takes hard and honest conversations. "We need models of possibility… It's not a simple three-step conversation; it's a life-long process of learning." And ultimately, he says, "we need to restore the world's faith in men." Click 'listen' above to hear the full conversation. What would Kate Millett have said?